What’s going on with My Health Record? You will get one automatically next year. But if you don’t want a My Health Record, complete the online process by 31 January 2019. The deadline for opting-out was to have been this month (Nov 2018) but the Government responded to calls for an extension so people could make an informed choice. My Health Record is an online database of our health information. This information can make a big difference to the way governments prioritise and resource health programs – like, what are the emerging health problems, where are they and who is at risk? But people are worried about information security and whether the Government can protect the information from hackers. Another concern is whether your private medical information will be shared with other parties, such as insurance companies. If you’re thinking about opting out, don’t leave it until the last minute. 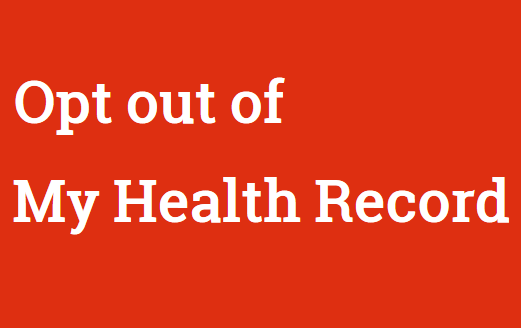 Go to the My Health Website https://www.myhealthrecord.gov.au/…/opt-out-my-health-record and be ready with your driver’s licence, ImmiCard or passport handy, along with your Department of Veterans’ Affairs (DVA) or Medicare card.